I’m a pasta fanatic. I could eat noodles of some variety almost every day of the week and be thrilled about it. Last night my husband made this Honey Balsamic Chicken & Kale Warm Pasta Salad — yes, the name is a mouthful, but I wanted to make sure it was adequately descriptive for this incredible dish. My husband is a talented cook, and that’s not just coming from me. You can ask any of our family and friends or his regulars (he is in the food truck business), and they will emphatically agree: Mateo makes delicious food. Even still, I did not expect this dish to be SO amazing. STEP ONE: Prepare pasta according to directions on box. Drain and set aside when finished. STEP TWO: Add chicken to an oiled (we love coconut oil) large sauté pan on medium-high heat. Cook until chicken is just browned on the outside. STEP THREE: Add onions, peppers, garlic, italian seasoning mix, and a pinch of salt and pepper. Continue to cook, stirring occasionally, until onions and peppers soften and begin to caramelize. STEP FOUR: Add chopped kale and reduce heat to medium-low. Stir in kale and cook until it is slightly wilted and becomes a rich deep green in color (about five minutes). STEP FIVE: Remove sauté pan from heat. Combine with pasta in a large mixing bowl. Add olive oil, balsamic vinegar, honey, and lemon juice. Mix until pasta, chicken, and veggies are well-coated. Enjoy warm, or you can serve chilled. It’s delicious either way! 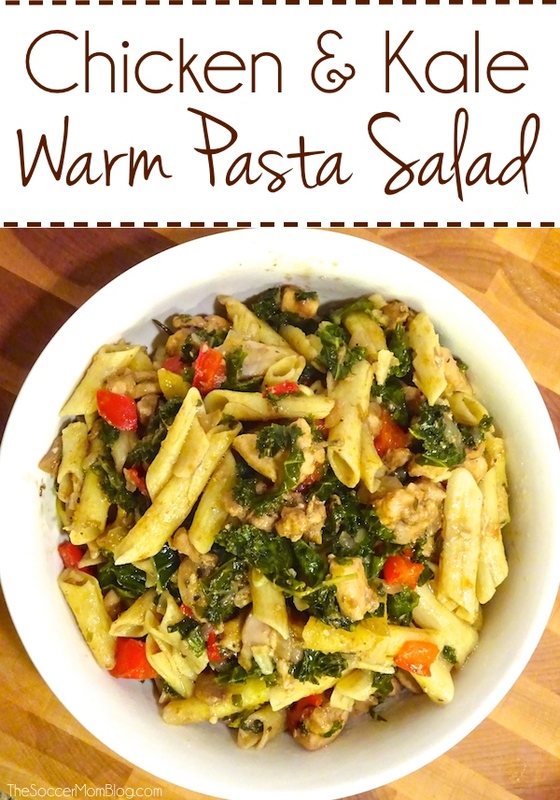 This Honey Balsamic Chicken and Kale Pasta salad is served warm and packed full of flavor. Prepare pasta according to directions on box. Drain and set aside when finished. Add chicken to an oiled large sauté pan on medium-high heat. Cook until chicken is just browned on the outside. Add onions, peppers, garlic, italian seasoning mix, and a pinch of salt and pepper. Continue to cook, stirring occasionally, until onions and peppers soften and begin to caramelize. Add chopped kale and reduce heat to medium-low. Stir in kale and cook until it is slightly wilted and becomes a rich deep green in color (about five minutes). Remove sauté pan from heat. 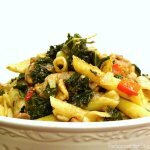 Combine with pasta in a large mixing bowl. Add olive oil, balsamic vinegar, honey, and lemon juice. Mix until pasta, chicken, and veggies are well-coated. Enjoy warm, or you can serve chilled. It's delicious either way!